I’ve just finished reading Asa’s post and I took a look at the real-time stats. This entry was posted in Firefox, planet by flod. Bookmark the permalink. The data which gets returned seems to only include countries which had at least one download in the time period which is going to be shown. 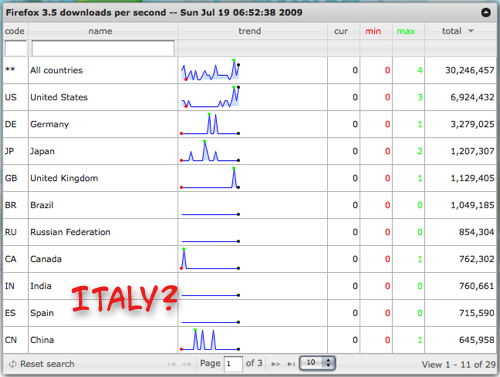 Lots of smaller countries have missing intermittently right from the start (I remember seeing Gabon going over 666 downloads, and then disappearing again on the next load). As the page also only seems to track Firefox 3.5.0 downloads, its stats have dropped off precipitously with the release of Firefox 3.5.1 (right before this release, the average worldwide number of downloads was still around 20/second, which is what makes me rather certain it’s not tracking 3.5.1), and so now even big countries are vanishing from the list. Wait for their daytime, and they’ll be back. You can probably safely expect the number of Firefox 3.5.0 + 3.5.1 downloads to be nearing 40 million already. I just realized that the site hadn’t been updated to track 3.5.1 yesterday and logged bug 505052. For 3.5, we were counting full downloads and complete automatic updates because those were manually initiated. You are indicating in your comment above that you don’t think we should count some types of downloads when tracking 3.5.1. Could you clarify? What do you think we should be doing? I’ve always thought that these statistics were counting “full” downloads (for example those made from the download.mozilla.org) and excluding partial updates. What do you think we should be doing? For example, if that’s a measure of how many people switched to Fx3.5.x (both from older versions of Firefox or different browsers), I think we shouldn’t be counting minor updates from Fx3.5 to Fx3.5.1, while we should consider major update from Fx3 to Fx3.5 and full downloads. BTW, I tried downloading a fx3.5 build but this didn’t trigger an update of the table. You didn’t download it off of http://ftp.mozilla.org, did you? ’cause those are never counted.